Cross Border Trading and Borrowing in the EU ETS A. Denny Ellerman* and Raphael Trotignon** This paper exploits a little used data resource within the central registry of the European Union�s Emissions Trading System (EU ETS) to analyze cross border trading and inter-year borrowing during the first trading period (2005- 2007). Cross-border flows were small in the aggregate but remarkably frequent in matching allowance deficits and surpluses at the installation level throughout the EU. These data also indicate that a novel feature of the EU ETS�the ability to borrow allowances from the forward allocation to satisfy current compliance requirements�was also used. These data provide evidence that the precondition of efficient abatement in a cap-and-trade system�widespread use of trading opportunities�was present in the first period of the EU ETS. 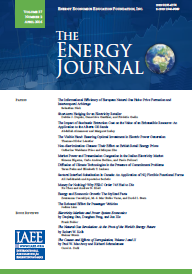 Proceedings - An analysis of allowance banking in the EU ETS.